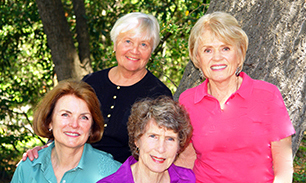 Galapagos to Grammie Guide: That’s the trajectory of the 232-page handbook on grandparenting that four San Jose-area women have written and published. Their company, Tell-A-Gram Publishing, started because of Richard Mobilio, an adventure travel buff who wanted to visit Ecuador. He and his wife, Laurie, put together a group of about a dozen couples in their 50s and 60s, including some they’d known for as long as 25 years, to make the trip. Late one day aboard ship, when the group was relaxing, some of the women got to talking about children’s songs and lullabies. Not able to remember all the lyrics, they turned to fellow travelers Jan Eby and Lynne Noel, both preschool teachers, for the information. That led to an enthusiastic conversation about what they—all recent grandparents—needed in a resource. And so they wrote one. Well, it wasn’t actually that fast or that easy, they recalled recently via speakerphone. Home from the 2003 trip, the four members of the group—Noel, Mobilio, Eby, and Cindy Summers— continued to brainstorm what would become The Grammie Guide: Activities and Answers for Grandparenting Today. Writing then as the grandmothers of six children under the age of seven, they were inspired partly by happy memories of activities they’d enjoyed with their children and partly by the realization that they no longer remembered all the how-to’s for finger plays, homemade play dough, alphabet and number songs, lullabies, and simple games. As the quartet discussed the book with other grandparents, they came up with more goals. It would also be a reference guide to toys, books, music, gardening, art, and developmental stages. Although the title says “grandmothers,” they note that the book was always intended as a resource for everyone who works or plays with young children, including babysitters, preschool teachers, parents, and extended family. These grandmothers knew where to find all this information. Three of the four have education backgrounds. Noel was an elementary school teacher and preschool director. Eby also taught elementary school and later ran early childhood education programs. Summers, another teacher, started her career with special education students. The fourth partner, Mobilio, is reportedly someone who can create games out of thin air. Self-employed for most of her career, she is the only one with entrepreneurial experience. Each of the four has known at least one of the others since the mid-1970s, when their children were together in play groups, Brownie troops, or school classes in the area where they all still live. All four partners remember the research and writing as a delight. Once they had created an outline of the book, they each assigned themselves chapters to draft, and they met at least weekly to review progress and combine the writing done to date in the growing manuscript. “What became obvious almost immediately was that we had the same philosophy for the book,” Mobilio recalls. And, Summers adds, “We discovered we had great respect for each other as grandparents.” That kind of respect is a must for team projects, they emphasize. Even if collaborators don’t share philosophies, they must respect each other’s perspectives. Not that enthusiasm and mutual respect necessarily mean fast progress, however. “’Are you still writing that book?,’ our husbands would ask,” Noel says with a laugh about a manuscript that took years to complete. One reason for the lengthy process: Each of the authors read every word of the manuscript (and had the option to edit what any of the others had written). Then, once they started contacting publishers, they discovered they had much more work to do. Among their many rejections was a helpful one suggesting they find and hire a freelance editor to process the manuscript before approaching more editors at publishing houses or considering self-publishing. That led them to Ellen E. M. Roberts of Where Books Begin in Bethlehem, PA, who surprised the authors with emphatic advice. The manuscript, she said, should be significantly revised. “That was our biggest challenge,” Noel remembers. “It was hard to do the reorganization that she said was necessary, but it was such a wise recommendation.” Roberts also recommended expanding the text to include more “screenfree” and outdoor play. As they revised their manuscript, these publishing novices had a special asset, help from Valerie Lewis, the co-owner of Hicklebee’s bookstore in San Jose, who encouraged them and eventually provided a list of book designers to consult. The designer they chose after long-distance interviewing suggested possible illustrators, and the grammies consider themselves fortunate that they were unanimously in favor of approaching Phyllis Harris and that she agreed to work with self-publishers. Published in fall 2012 with a print run of 1,100 copies, The Grammie Guide went into the partners’ garages—and out of them almost as fast. The quartet got them sold through a launch party (“All those waiting grandmothers!” Noel says), through appearances at local stores, libraries and clubs, and through online retailers. Thirteen months later, with a second printing of 2,200 coming off the press, they signed with the Small Press United division of Independent Publishers Group for distribution. But now, with only a third of that second press run sold, the partners are facing one of the realities of book publishing: marketing challenges. “We so enjoyed writing the book, and once it was done, we were ready to sit back and enjoy seeing the book in use,” Mobilio says. Making contacts in the media and among prospective customers is a long, laborious process, especially for authors without experience in public relations, prospecting, and sales. Many promotional efforts take years to yield results, or never do. Reviewers aren’t usually interested in books more than a few months old (although reporters and producers may be, especially when newspegs can be part of the pitch). A book’s title can signal such a narrow focus (in this case, on grandmothers) that it becomes difficult to pitch the book successfully to other important audiences (which in this case include preschool and primary grade teachers, nannies, and parents, among others). Another challenge: Although they have a Facebook page for the book and recognize that social media are important for reaching younger readers, the authors/publishers aren’t social media savvy. But they do have time to promote the book, with three of the four now retired, and each of them has an engaging sense of humor. Four self-publishers are better than one, they point out, because there are four garages in which to house unsold books. Use the recently released e-book version as a news hook for generating reviews in regional and national parenting and women’s magazines. Develop a few “evergreen” articles based on book content for submission to blogs and for use when responding to writers’ queries on HARO, helpareporter.com. Create speech outlines that can be used with only minor revisions for different audiences and presentation lengths. Create Facebook and Twitter posts and contact traditional media to publicize the universal value of the book, as reflected in its presence in libraries as distant as Edmonton, Cairo, and Taipei. Pursue more library sales, and start by contacting members of the California Library Association that do not yet have the book. Something even better than the road map may also help them market their book in this new year—their pride in The Grammie Guide, and their continuing respect and support for each other. “Contrary to our editor’s prediction, we are all still best of friends,” they chorused as our interview ended. Linda Carlson (lindacarlson.com) writes from Seattle, where she has never mastered the cat’s cradle string game or the lyrics to Brahms’ Lullaby.